What are you saying to yourself? Pay attention – not only to your words, but also your thoughts! How often do you find yourself saying, “I am sick and tired of..” or “I am guilty of…” or “I am angry,” or some other formation of words that are the opposite of how you really want to feel? What if you remembered the Truth of Who You Are instead, and began thinking and speaking from the Truth in your Heart? Every time you use the words “I AM” you are literally instructing yourself to think, believe, and feel a certain way. You are telling your subconscious mind what to filter out and disallow, and what to let into your awareness. You are commanding the Universe to form an outer reality which matches the declaration of what you just said. 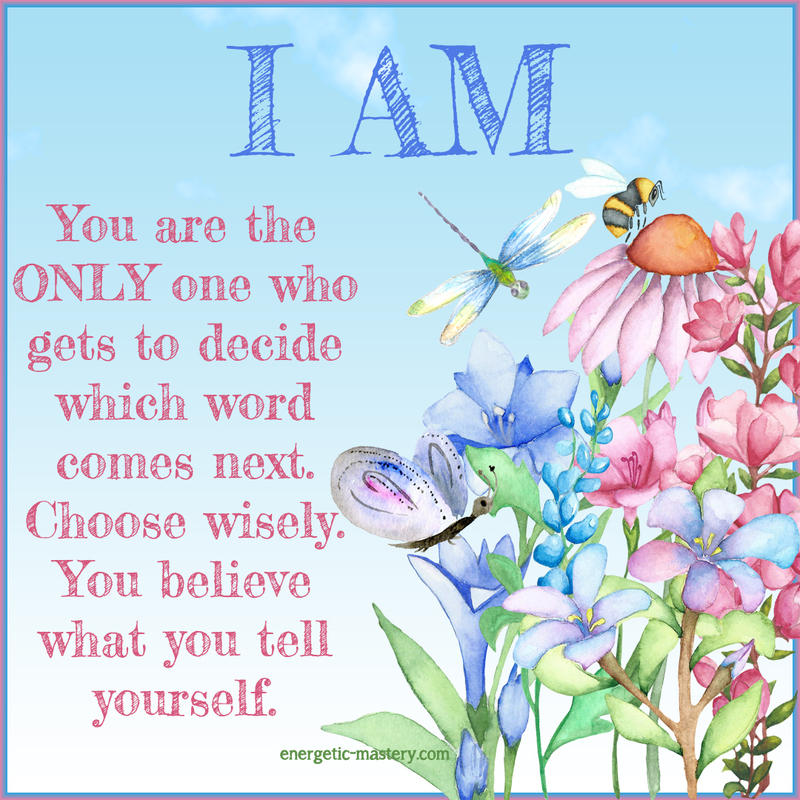 You are the only one who gets to decide on the word that comes next, after you declare “I AM.” Choose wisely. You believe what you tell yourself. Instead, choose Truth. I AM Love. I AM Joy. I AM Peace. I AM Truth. I AM Power. I AM Spirit. That is the Truth of Who You Are, after all. It doesn’t mean that you ignore the other thoughts and emotions you’re experiencing. It just means that you are instructing yourself to remember Who You Really Are and declaring to yourself that you are choosing to feel what is True, and commanding the Universe to match that instead of all those other things you used to tell yourself. Remember that you deserve and that you are allowed, you are enough, and that you can have all of your Heart’s desires. Pay attention to all you think and feel and say and do.